Last week Mark and I had a well needed break from work. We didn't want to do much, just chill, enjoy being in the house and have one or two days of camping fun in the beautiful Lake District just on our doorstep. 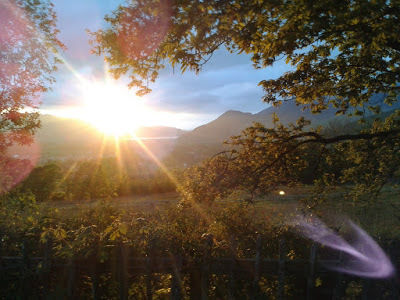 Keswick camping has been a tradition for the past few years for Mark and I, always the first camping trip of the season, as it is super easy and near to home if all goes horribly wrong (it never does!) You can see last year's post here. We just love Castlerigg Hall campsite and want to come back again and again. It just has everything and in a fab location in the town of Keswick, up on the hill. The walk back up the hill is always interesting, but it's good for a challenge and to burn off the food and drink likely consumed in the town! So we arrived on the Wednesday late afternoon, got the tent up, had a bite to eat on the camping stove and then wandered into Keswick town centre. We decided to pick a different route, going down the woods at the back of the campsite and going for a little explore. The wooded area takes you onto some back roads in a residential part of town, but this is the posh bit of town! Well all of Keswick is posh really, you have to be rich to afford Lake District National Park prices but this street is something else, with huge impressive houses. I loved this little gate and huge tree. Just off from this street we spied another little path, a little path that neither of us had been down before. We have both been coming to Keswick for years and just when you feel like there are no new bits to explore... you find THE best. We went up and up through a pretty wooded bit... Mark waiting for me as usual! And we were rewarded with THE view, not just any view, but the best view I believe of Derwent Water I have seen, and I've seen it from pretty much all angles! SO pretty. Such a fab view from all directions, either looking down at the lake or to the picturesque town! Those town planners do a good job don't they. Well I could have stayed sitting on that seat all night! It was also really cool having the mountain sundial type thing too. I fail as a Cumbrian in that I still cannot name half the mountains by sight. Then back on to the campsite to enjoy this beautiful sunset before into the tent to get cosy and warm and sleep. The last photo was taken by Mark .